New CompuWeigh process hopper scale is used to generate accurate rates for loading railcars at Larson Grain Co.’s dry edible bean processing plant in Englevale, ND. Photos by Ed Zdrojewski. With a commodity as valuable as dry edible beans, getting accurate weights is critical. But accuracy wasn’t happening at privately-held Larson Grain Co.’s bean plant in Englevale, ND (701-683-5246). Of Larson Grain’s six elevators around southeastern North Dakota, Englevale is the only one handling dry beans – pinto, black, and small red. The company loads dry beans onto a single covered hopper car at a time on the Red River Valley & Western Railroad and ships them to customers throughout the United States and for export. 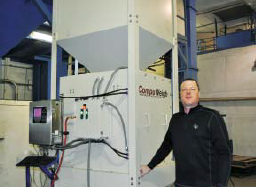 General Manager Nick Shockman with the new CompuWeigh process hopper scale. Larson Grain’s employees liked what they saw and purchased the scale in fall 2016 immediately after harvest. The pneumatically-powered scale, using air supplied by Larson Grain, is located at a warm, indoor location well away from the elements. However, Larson Grain mounted the device on caster wheels, in order to make it portable. Dry edible beans destined for rail shipment are fed into the scale’s upper garner at a rate of 35,000 lbs. (350 cwt.) per hour. The operator utilizes a CompuWeigh DWC-400 Weight Controller to operate the machine. A keypad allows the operator to type in customer name, order number, product, total weight, and draft weight. Beans are deposited directly into the upper garner from a fixed overhead spout centered over the device at approximately 35,000 lbs. per hour. With a density for dry edible beans calculated at 48 lbs. per cubic foot and a 10-cubic-foot weigh hopper, each draft totals a 480 lbs. That may seem very small by today’s high-speed grain handling capacities, but dry edible beans are relatively fragile, and customers demand strict limits on broken kernels. Larson Grain loads a single railcar at a time adjacent to the building. certified by an independent third party. 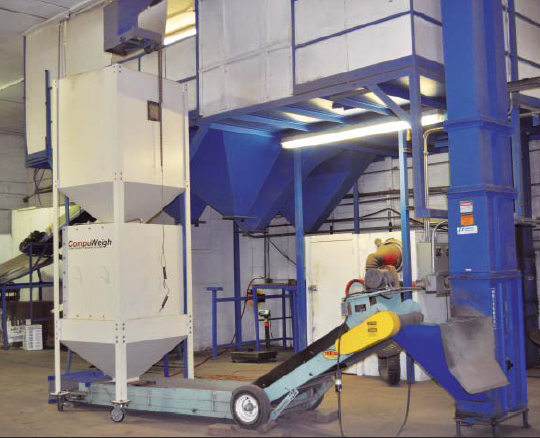 Shockman says that using the new process hopper scale, it takes approximately five hours to load a railcar.